"It's really cool to see what an actor will do with the same content," said Vijay. Directed and written by Sandeep Vanga, ‘Arjun Reddy’ won critical acclaim and was a commercial hit! The film, starring Vijay Deverakonda grossed Rs 50 crore in India and struck a chord with Telugu cinema-goers. So, it’s natural that the film was destined for a remake. Well, for Bollywood lovers, that dream came true when we heard that the makers of the film had zeroed in on Shahid Kapoor for the Hindi remake. 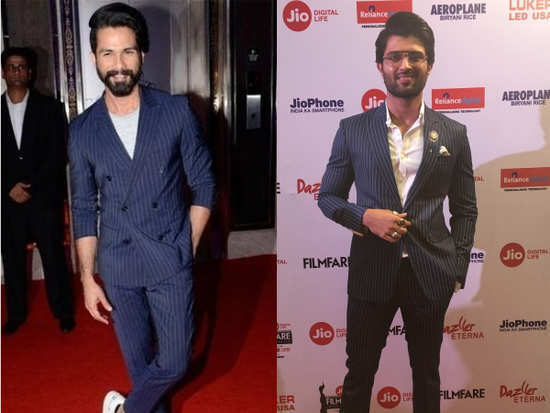 Shahid has agreed to step into the shoes of Telugu actor, Vijay Deverakonda for the emotional drama and we can’t wait for the film to hit theatres! ‘Arjun Reddy’ is a story of a medical surgeon suffering from anger management issues who goes on a self-destructive path after his girlfriend marries someone else. And it’ll be interesting to see how Shahid plays the role. Now, while we did know about the remake, we hadn’t yet heard how Vijay felt about Shahid playing his role. Luckily, we bumped into the actor at our 65th Jio Filmfare Awards (South) 2018 over the weekend and the actor expressed to us his opinion about the remake. "It's really cool to see what an actor will do with the same content or how they read into the same scenes that I did. So, as an actor, it will be really interesting to see,” Vijay said. We sure are excited about this one! 5'Zero' teaser: We couldn't have received a better Eid gift! 6Kylie Jenner deletes all photos of her baby girl, Stormi Webster on Instagram! 7Nick Jonas brings Priyanka Chopra as his date to cousin's wedding!